The demands of this design were challenging. “The Robot couldn’t be too scary or have a comical tone. It needed to look serious but in a non-threatening way. It would be used to greet guests and convey an ecological message to all Rock In Rio attendees.” Says Steven Diamond. 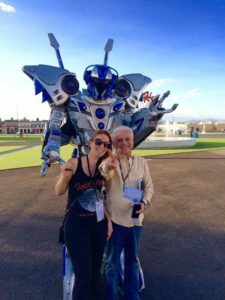 “Plus, it needed to convey it was a musical robot.” This Robot needed to have a metallic look and feel while maintaining it’s mobility as it would need to be able to move around the festival grounds while greeting attendees. 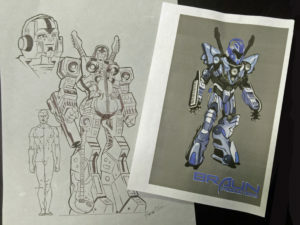 Bringing a concept design into reality by redesigning the concept art to actually fit a performer inside was no small task. During the design phase, important tests were conducted focusing on important issue like the weight of the costume and other critical factors. The selected materials to be used in construction were very carefully selected. Every nut and bolt, every piece and part, every LED or Strobe light used has a weight to it that all adds up very quickly. “We were very cognizant that a performer would not only be performing in this suit but carrying around all of this weight for long periods of time. So every ounce counts.” Said Diamond. It’s a unique balancing act between looks, weight and functionality. 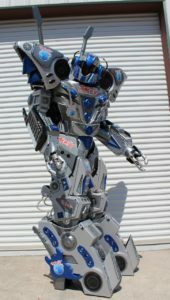 There would be the need for an internal communication system that only the performer could hear, as well as a built in microphone to allow the robot to communicate with the audience. We also installed a series of pre-recorded phrases that the client wanted the Robot to say. This would require an internal trigger system that the performer could use to select each phrase. The robot was required to talk using a jaw that could be animated. An extensive speaker system would be needed to broadcast to the outdoor audiences as well as a series of music tracks that he could play while walking around. This robot needed a personality. Creating that personality would come in several different forms. First and foremost were the facial expressions, eyes and other features of the helmet that could help the robot communicate. Special auditions were held to select performers that not only had the physical strength but the endurance required to stay in the costume for long periods of time under extreme conditions. Braun Productions would hold character workshops to develop unique movements, dance moves and other attributes that would help this amazing creature have a life of it’s own. A very happy, Roberto Medina and his lovely wife (Pictured Left) were very happy with their new custom designed robot that Mr. Medina affectionally called “My new baby”. In addition to all of the bells and whistles, Braun was tasked with the design and fabrication of a personal Robot transportation vehicle. This special vehicle would need to safely and securely move the massive robot from point A to point B or anywhere he was needed. Braun Productions produced a special cart with the unique capability to lift the robot up several inches so that he could ride on the back of a heavily modified “Cricket” type scooter. Special airbags were used to raise and lower him so that he only needed to step onto the back platform and be strapped in. It was a clever solution to a unique problem. No matter what the vision is, Braun productions can find creative solutions to fit your production, on time, on budget. 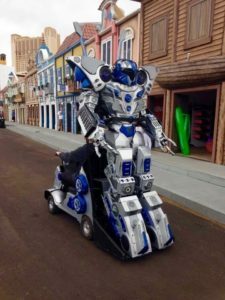 We specialize in the design and fabrication of unique one of a kind props, costumes and equipment that you simply can’t find anywhere else. Call Braun Productions today to learn how we can create wonder for you! Call 702-731-3133 for more information.